Since their formation in 1996, the Two Dollar Pistols, led by baritone singer John Howie, Jr., have gained the respect of country music fans worldwide through international touring and four critically acclaimed releases. With a soulful honky-tonk country sound as their foundation, the Chapel Hill-based Pistols drive their music home with an energetic edge that leaves their audiences wanting more. 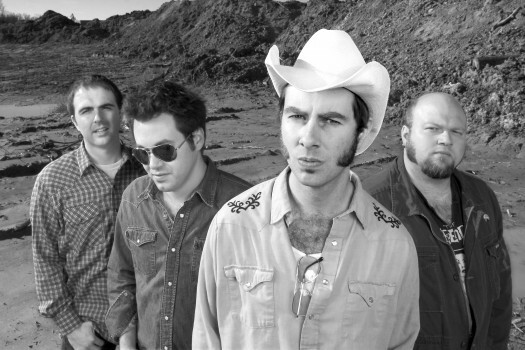 The Two Dollar Pistols’ debut, 1997�s On Down the Track(Scrimshaw/Mammoth), was greeted with immediate regional praise and quickly climbed into the Top 20 of the Gavin Americana Chart. In 1998, the Two Dollar Pistols began their relationship with Yep Roc Records by recording a spirited live set, Step Right Up. The album earned the band two awards from Austin, TX’s 3rd Coast Music magazine, “Best Live Album,” and “Best Male Vocalist” for Howie. In 1999, following several enthusiastically received local gigs together, the band and Tift Merritt were coaxed into the studio to record a set of duets. The resulting 7-song EP release, The Two Dollar Pistols With Tift Merritt, quickly became a fan favorite and was Merritt’s (now a popular Lost Highway recording artist) first CD recording and release. The Pistols’ 2002 Yep Roc long-player, You Ruined Everything, was a full band effort with a line-up featuring Howie, Scott McCall (lead guitar), Neal Spaulding (bass) and Mark A. Weaver (drums). With tracks ranging from danceable shuffles to country-soul tearjerkers, the album showcased Howie�s warm baritone vocals and managed to conjure a classic, timeless feel while maintaining a contemporary honky-tonk sound and attitude. The band � a group of players capable of shifting gears from a Buck Owens/Ray Price-styled shuffle to a soulful weeper without missing a beat � played the US and abroad and built up a committed following for their live shows. Hands Up! explores Howie’s fascination with Nashville songwriting and arrangements � from the “countrypolitan” sound of Glen Campbell’s ’70s hits to the yearning country-pop of a Roy Orbison-inspired tune � all delivered in Howie�s rich, signature baritone vocal style. Howie recently told the Independent Weekly that he hopes that people will think of the Pistols as “a country band that likes R&B, that likes rock’n’ roll, that likes rockabilly, that likes The Beatles, but not a rock ‘n’� roll band that likes country music.” What the Two Dollar Pistols are about is crafting fine songs and playing great music � period. Get THE TWO DOLLAR PISTOLS WITH TIFT MERRITT now on vinyl.